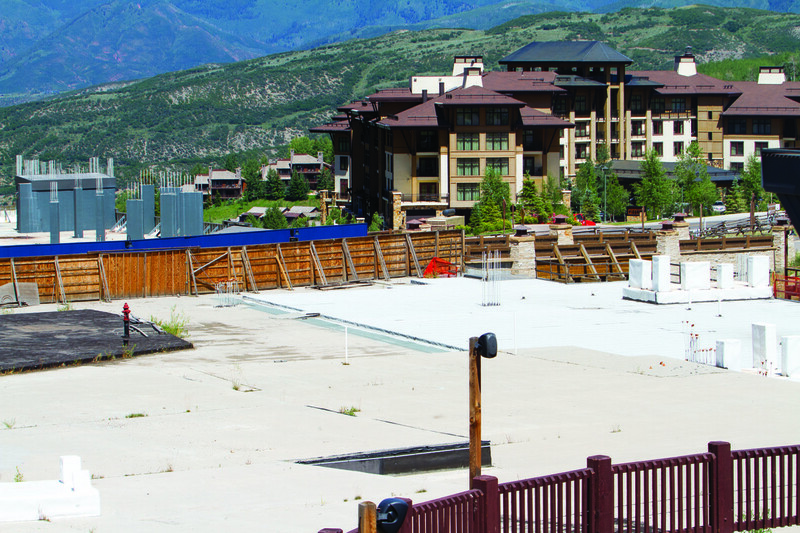 SNOWMASS VILLAGE – The Snowmass Village Planning Commission is recommending that the owner of the Base Village properties be given a four-year extension to its vested property rights with the granting of one additional year if specific “milestones,” which include both public and private improvements, are completed by set deadlines. The town’s community development staff had recommended a three-year extension of the vesting for Snowmass Acquisition Co. — the Related Colorado subsidiary that repurchased all of Base Village — with two additional years if targets were met. The vesting is set to expire in November. Company president Dwayne Romero successfully argued during Wednesday’s meeting that the groundwork, construction and completion timetables were just too tight to meet the three-year proposed time frame. “My heart says three years but my brain is telling me something different,” said planning commission chairman Bob Sirkus. The commission will recommend that vesting continue until Nov. 3, 2018, with an automatic one-year extension if deadlines are met for a roundabout, upper Wood Road improvements and substantial completion of the second Viceroy hotel building. The developer also must submit by Oct. 15 an application outlining the future of the Base Village project so that a “piecemeal approach” to construction is avoided. Romero’s biggest victory on Wednesday was shooting down a suggestion, made repeatedly by commissioner David Rachofsky, that Related Colorado provide “completion security” in order to guarantee that the partially constructed buildings within the project are eventually finished. “It could either be a completion bond, a letter of credit in the amount needed to complete the project or a guarantee by the ultimate parent of the Related group that the project be completed,” Rachofsky said. Romero said his company’s position on this topic has remained unchanged. “Coming up with new securities and guarantees in the face of half-built structures or otherwise, the answer is ‘no,’” he said. Romero added that in the city of Aspen, (where he is a councilman), restitution bonds are required in the early phases of a project, which could help to restore a property to its original state. Rachofsky is looking for a guarantee with more teeth. “We are not starting with fresh, unbroken ground which could be left fallow if they decide [not to finish],” he said. “We’ve got a blight on the community in the form of funny looking buildings,” as well as concrete foundations that Rachofsky said were unsightly and hurt property values. But he wasn’t able to sway the other five commissioners in attendance, who seemed satisfied that performance bonds, contractor guarantees and other milestones tied to the vesting extension would be adequate. Related Colorado also has inserted a clause about a “force majeure” that could halt forward movement on the project in the event there are labor disputes and/or unexpected weather. Town attorney John Dresser noted that the clause is new with this minor planned unit development (PUD) application and not something in the original 2004 Base Village agreement. Dresser suggested it’s one of the areas where the Snowmass Village Town Council should weigh in with an opinion. The timetable and site of a permanent home for the Snowmass Clinic, which was originally eyed for Building 8 (one of the two faux front structures on Wood Road), also will be subject to further discussion. Related Colorado’s schedule doesn’t show completion on that particular parcel, which it has discussed using for time-share or vacation club properties, until 2019. Also left for future discussion is whether an aqua center is the correct amenity for Base Village. If the planning commission votes on an amended resolution at its Aug. 6 meeting, then town council would begin its review on Aug. 18. Editor’s note: Aspen Journalism collaborated on this story with the Aspen Daily News, which published it on Thursday, July 24, 2014. Follow Madeleine Osberger on Twitter – @Madski99.